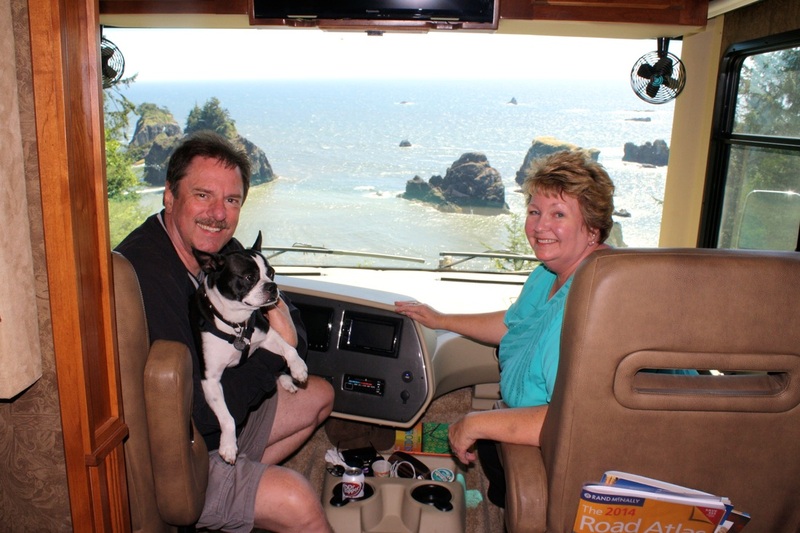 On March 13th, 2014, Pam and Paul joined the RV-world when we picked up our new 2014 Tiffin Allegro 35QBA motorhome. We have owned a 2016 Tiffin Allegro RED 33AA, a 2018 Tiffin Phaeton 40 IH and currently own a 2019 Winnebago Navion 24D. The purpose of this blog is to document the trips we take to share with family and friends - many of whom we hope to have come along with us or meet somewhere in between their homes and ours. While I was looking for the perfect URL for our new blog, I thought of "Thompson's Treks" because "trek" is the perfect word to describe our future journeys. Looking up the word "trek" in a Thesaurus gives all words that the we hope to enjoy over the coming years in our RV: "journey, trip, expedition, safari, odyssey, voyage; hike, march, slog, tramp, walk; long haul." Sound like fun? We hope to see you on the road, soon! Paul, Spanky & Pam at Oregon's Samuel H. Boardman State Park Windy Point overlook.